Habitat: Upland. This wildflower can be found growing in grasslands and in oak-juniper woodlands. Flowering Season: Summer. This plant blooms after the summer monsoon rains have begun. Description: The flowers have 5 oval petals and are followed by large seed capsules with 3 seeds. 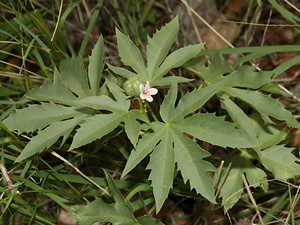 The leaves have ragged, irregularly-toothed margins and are green, fleshy, alternate, and palmately-lobed with 5 to 7 main lobes. The stems are green, fleshy, and will ooze clear sap if broken. The root is an enlarged, potato-like tuber. Poisonous – The plants and especially the seeds are poisonous and contain the potentially fatal phytotoxin curcin (similar to the deadly ricin) and a purgative oil that causes severe vomiting. 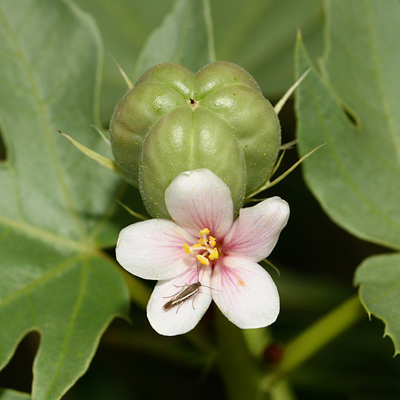 Children are the most susceptible to this plant's toxins. Although the tuberous roots look like potatoes and taste sweet, they are also poisonous.